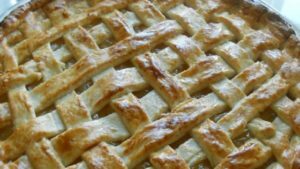 Although ‘National Pie Day’ came and went on January 23rd, it is not too late to bake a pie that is both nourishing and delicious. One of my favorite pies – and one well worth trying is pineapple pie. The first pies appeared around 9500 BC in the Neolithic period. Beat on low eggs slightly, add butter, lemon juice & water. Add sugar, flour & salt. Beat until smooth, pour in pineapple & stir.